With the 2014 Winter Olympics now pumping away at full steam, we can assume that the Sochi Games, which end on February 23, will essentially consume the next two weeks of our lives. And if the 2012 London Games are any indication, this also means a whole lot of complaining about NBC, which has exclusive broadcast rights to the Games here in the US – you might as well just get familiar with the #NBCFail hashtag right now because it’s not going anywhere. Fortunately, it doesn’t look as though the complaints will rise anywhere close to 2012 levels – NBC has officially embraced live streaming the Olympics. Unfortunately for those of us who prefer to access our entertainment online, the entire thing remains an Olympic-sized mess. In total, NBC plans to air 1,540 hours of Olympics coverage, of all 15 sporting events, across its website and various stations. Back in 2012, you may remember, the network opted to cover a fraction of the sporting events, and did so with an imposing tape delay that spat in the face of our real-time, what-I-want-when-I-want-it connected lifestyles. It robbed us of our ability to enjoy the games live with the rest of the world, and burdened us with maddening, futile attempts to avoid event result spoilers. This year, however, NBC has changed its tune about live streaming events. The network is providing more than 1,000 hours of live-streamed footage of Olympic events via NBCOlympics.com and the NBC Sports Live Extra app, without the pesky tape delay. “Every hockey game. Every downhill run. Every figure skating routine. All available for viewing LIVE – with no additional cost to authenticated TV subscribers – as part of NBC Olympics’ digital offering from Sochi,” boasts NBC on its website. Of course, you’ll still need to have a cable or satellite subscription login for unfettered access to any of those live streams – an infuriating stipulation, especially for cord-cutters like myself. Non-paying customers can snag 30 minutes of live streams for one day, and then just five minutes after that. Heavily edited highlights and other tidbits will be available for subscribers and cord-cutters alike. Cable subscribers will also have access to NBC’s newly launched “Gold Zone,” via NBCOlympics.com and the NBC Sports Live Extra app, which offers highlights as the day’s events progress, from 7 a.m. until 3 p.m. each day. Finally, Olympics fanatics can access schedules, results, and news stories via the separate NBC Olympics Highlights app. In total, NBC plans to air about 1,540 hours of Olympics coverage, of all 15 sporting events, across its website and various stations, which include NBC, NBC Sports Network, CNBC, MSNBC, and USA Network. All gold-medal competitions will air on NBCSN live. The channel will show a total of about 230 hours of Olympics coverage. 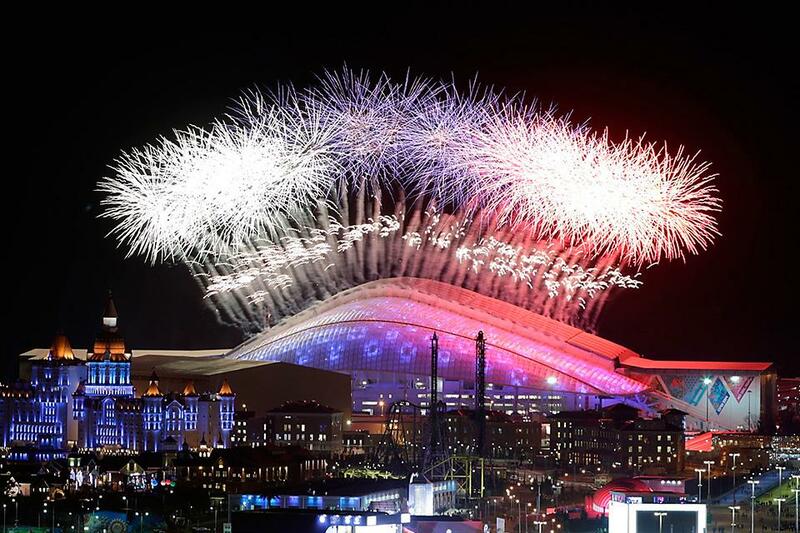 Despite NBC’s newfound devotion to live coverage, however, the network continued the tape-delay debacle this year for the Opening Ceremonies, which could have aired live at 11 a.m. ET on Friday, but was delayed until 7:30 p.m. last night so the network could “put context to it, with the full pageantry it deserves,” Mark Lazarus, chairman of NBC Sports Group, told Variety. And if you didn’t care about “context” and “full pageantry,” tough luck – NBC refused to air the Opening Ceremony live online, too. If all this seems overly complicated and contrived, that’s because it is. Why? Money, of course. NBC has invested some $4.38 billion for the rights to broadcast every Olympics, between 2014 and 2020 – that’s four Games, Winter and Summer. For the 2014 Sochi Games, NBC has sold $800 million worth of advertising to wrap around the events. And while that is a record for the Winter Olympics, the network still only expects to turn a small profit – which, in turn, is only possible thanks to NBC’s tactic of funneling viewers to watch during prime time, which will be filled with endless “human interest” stories and pontificating – the kind of “context” NBC believes Americans want. If all this seems overly complicated and contrived, that’s because it is. Why? Money, of course. In fact, even the expanded live streaming offering is part of NBC’s plan to get more viewers in front of their televisions during prime time. In short, NBC’s Olympics coverage strategy has greatly improved for those of us who want to take part in this worldwide event in real time. That’s great. But the economics of Games coverage – at least here in the US – demand that NBC do whatever it can to keep people glued to their TVs, where the real ad money is. That apparently means making things as complicated as possible for Web users. This contrasts with networks in other countries, which simply air everything both online and on television simultaneously. If that sounds like a better way, luckily, there are ways to skip NBC’s convolutions and skip straight to the point – watching the Olympics.